You thought that near-impossible Super Mario World glitch completion time was fast? It was just the beginning. At this point, Dotsarecool is in a race with himself to shatter that record, and he's confident he can pull it off, too. "Actually this run was only just average—there are still maybe about 4-8 seconds or more to cut off with better movement," he wrote of his most recent record-breaking run. You can see how he's improved from record break to record break on his YouTube channel. For those only just joining us, this glitch—which warps players from the game's first level straight to the credits—was only recently accomplished on a console. It does not involve any emulation and can be done from a good old-fashioned Super Nintendo, just as god and the pioneers intended. 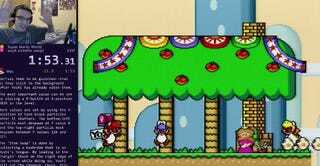 As a result, it's added a whole new dimension to Super Mario World speed-running. I suppose what I'm saying is, right now Dotsarecool gets to wear the crown, but he's gonna have to hang onto it awfully tight if he doesn't want someone else to pluck it right off his head.